Once a year, we can get a free credit report through the big three nationwide consumer reporting companies — Equifax, Experian, and TransUnion. You can do this check anytime during the year, but if you haven’t done so already, now is a good time to request your reports before time’s up. Go to AnnualCreditReport.com to get started. You can get more information on credit scores and credit reporting services here. Review your expenses for the year. We review the past year’s credit card report, checking account expense report or overall budget and see where all the money actually went. Check your spending patterns and see how the year turned out — did everything go as planned? Based on our spending, I am able to work out a new budget for the coming year to better control our expenses. Evaluate your financial strategies and plans. The holiday break serves as a great time to get the big picture on your finances (e.g. debt reduction, investment plans, insurance policies and budgets). Look into the financial strategies and decisions you’ve made. For example, if you have a little cash on hand, you may want to consider paying down the mortgage a little more. There may be investment opportunities that open up if the markets soften further. Try listing down all the options, then prioritize them and act! Get you family’s medical, vision and dental checkups done before the end of the year. Just because you’re feeling sprightly doesn’t mean you should skip out on your annual physical, especially since you’re allowed coverage on it on an annual basis. Also, if you’ve maxed out on your medical deductibles and you’re needing to see the doctor sometime soon, you may want to do it before deductibles reset. Depending on your plan, insurance deductibles may reset by the end of the year, so check your insurance policies for further details. Spend what’s in your Flexible Spending Plan (FSA). If you have an FSA, then you’ll need to spend what’s in it before the end of the year (or before the 2 1/2 month grace period you’re given) since an FSA is a “use it or lose it” benefit offered by employers. 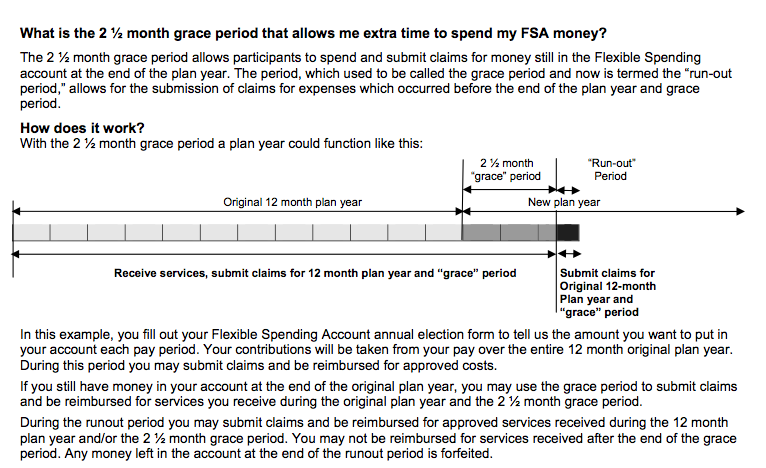 I found this example of a plan that discusses the grace period (and run out period). Get your insurance claims in. Just to keep myself organized, I’m trying to get all my health insurance claims filed by end of the year. I’ve got a few that I need to send out before they slip through the cracks! Before the year is over, consider applying some tax reducing strategies such as contributing further to your IRA or other retirement accounts. See if you can fund those retirement accounts (up to IRA contribution limits). If you can afford to max out your contributions to IRA accounts, and you haven’t yet contributed nor met the maximum, then this is your chance to catch up. I’m finding a moment to ensure that our IRAs are properly funded within our capabilities this year. Another wise move would be to check next year’s limits to see if there are new maximums, then readjust savings accordingly. The same holds true for withdrawing from your IRA: check guidelines that state how to withdraw your money for best tax treatment. Contribute to your 529 plans. You can still contribute without tax consequences to a 529 plan account. Find out what the maximum amount is that you can make without incurring a federal gift tax (e.g. what is the maximum annual gift tax exclusion?). For 2010 and 2011, it is $13,000 annually (or $26,000 per married couple). Or you can contribute a $65,000 lump sum (or $130,000 sum per married couple) that covers five years worth of contributions. More details on 529 accounts here. Give away gifts to your children or to other people within the gift tax limit. The best way to lighten your estate (and thereby adjust your estate taxes down the road) is to give away part of it. And the favorable way to do this in order to avoid incurring gift taxes is to give within the tax limits on a regular schedule (see previous point on 529s). Time to give away some last chance bequests for the year. Prepay those tax deductible expenses. See if you can accelerate payments you were planning to make in the next year by paying these expenses before the end of the year. In so doing, you can hike up your deductible expenses and shave a bit more off your taxes by April. One such example is to prepay your mortgage bill for the month of January by December instead. In so doing, you will make 13 payments this year thereby increasing your mortgage interest deduction. Take note that this is a good move if you anticipate being in the same or lower tax bracket next year. By the same token, you can prepay your property taxes to increase your deductions. Review your investment portfolio and account statements. Just like the mutual fund companies and financial institutions out there, you may want to check how your investments have done this year to make sure everything is going along as expected. Part of any investment program is to do regular check ups and evaluations of your investments’ progress. Perform a general financial checkup on an annual basis to ensure that you’re on track towards your investment goals. Check your asset allocation as well, to see if your positions need rebalancing. Sell positions in your investment portfolio for tax purposes. Check out your portfolio’s taxable gains and see if you can offset them by selling your underperformers. For next year’s tax returns, you may want to show some losses to balance your gains, so it may make sense to ditch some losers. It’s a smart tax move to get rid of poor performers and to incur losses that can neutralize any realized capital gains you have this year, plus up to $3,000 (in excess loss). Any extra losses can be carried over to the following year. Instead of hanging on to your unsuccessful investments, hoping that they would break even, just sell them and take a tax break. Moving on could be a much better money strategy. But watch out for wash sales. Defer buying mutual funds till the next year. Contrary to what you may think, there is such a thing as buying into a mutual fund at the wrong time. If you can, avoid lump sum investments into a mutual fund during the latter part of the year, particularly in December (unless you are in an automatic investment program, in which case you’re excused). Why? Because by the end of the year, mutual fund companies and financial institutions are required by law to pass on any fund capital gains to their investors. By making this timing mistake, you could owe taxes on a fund you’ve only owned for a short period of time and be subject to the same tax as those investors who’ve held the fund all year long. An exception to this rule is if you’re dollar cost averaging and you’ve automated your contributions to your funds. Make your charitable contributions and donations. If you haven’t done so already, consider some contributions to your favorite charities — these are tax deductible for the year. Remember that you can deduct whatever it is you give to charity: stock, cash, goods. Your employer may also have incentives to encourage donations — for instance, one of my employers would match employee contributions dollar for dollar. Take a minimum distribution from your IRA account. If you’ve turned 70 1/2 by the end of the year, take note that you’ll need to take a minimum distribution from your IRA account within the next few months. Please consult with your financial adviser or accountant regarding the amount you need withdrawn to fulfill the required minimum distribution. Prepare for any end of year windfalls. Whether it be cash gifts, annual bonuses and such, prepare for any windfalls you are expecting to receive by thinking about where you’re going to apply them. Actually, I probably don’t have any coming my way (but I can certainly be pleasantly surprised! ), but if you do, then plan on where to appropriate your chunk o’ dough now, before you are tempted to kiss it goodbye. Created December 10, 2007. Updated December 14, 2011. Copyright © 2011 The Digerati Life. All Rights Reserved. I love these reminders! Kind of a year end wrap up, leave it behind and move on kind of thing. Thank you! You got me thinking enough that I’m going to write my own post with my plan for each of the points you made! Thanks Andy! I love to hear what others do as far as financial tasks go. I may pick up some good tips! Start gathering your statements together in order to be prepared for the tax season. Look at your budget at the beginning of the year and analyze what went well and what went wrong. If you were constantly over budget months after months on a specific category, change it for next year. We tend to underestimate our expenses. The use of a money management software such as Microsoft Money or Quicken can be helpful. Establish your goals and priorities for the upcoming year. You have to plan in advance, if not, you will not get anything done 🙂 . I like to see that your employer matches your charitable contributions. You must work for a great company. Do they offer that or is it something you approached them about? @The Financial Blogger, thanks for the suggestions! I’ve incorporated some of them to my list (with an update). I try to create plans well in advance but I often find myself having a hard time executing on task promptly. One of the things I hope to improve in the next year is my handle on time management. @My Dollar Plan, this erstwhile employer has some of the best perks and benefits around, being as it is a large and established company. It’s a shame that I didn’t stay with them. The charitable contribution match is on their benefits list and this is something they offer everyone in the company. This happens every year during the period of their annual charitable drives and fund raising. Love the list. Now I just have to stop being lazy and do it :D.
Credit report down, a few more to go! Look for every deduction you can find. Charitable deductions can really get that taxable income down. Oh boy, I have some work to do. I’m hardly past #2! I do keep close track of my credit report and credit score, but I need to get on the ball as far as everything else goes. Thanks for the info. You have given me the reason to ponder upon personal money management tasks. good post! Here’s another post I recently visited which I found quite informative. This has been a great tool for my study of personal finance. thank you. My advice for the Christmas vacations would be to stay away from the discount sales, last day offers and free trial products. Before making any buying decision you need to take some time to think if you really need that thing. Very good points here! I’ll be more budget and health conscious because they are my major concerns. Great list – especially (to me at least) the mutual fund advice. A lot of people mess that up. I just checked my 2011 goals and realize I’m behind on a few of them, so I had to kick it into high gear with a new commitment for 2012. Of course, most of those are “big picture” things. It’s amazing how quickly the year goes!